NEW YORK CITY — Team Members from U-Haul Company of Brooklyn/Queens/Staten Island recently added to the holiday season by teaming with longtime charity partners Kathryn Cross, a Gold Star Mother and artist, and the USO of Metropolitan New York for the 8th annual Holiday for Heroes Packing Event. The Holiday for Heroes Packing Event took place at the Port Authority of New York and New Jersey bus terminal. 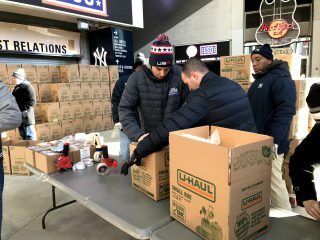 Team U-Haul and Cross, together with other USO of Metropolitan New York corporate partners and volunteers, assembled 5,000 holiday care packages for service members around the world. U-Haul proudly donated the boxes and packing supplies to assemble the care packages. The care packages go to troops serving in Afghanistan, Djibouti, Iraq, Jordan, Kuwait, Qatar and the UAE. In addition to the many heartfelt items, U-Haul and Cross added Tribute Journey greeting cards to all packages. 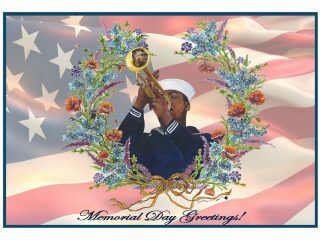 Tribute Journey greeting cards are expressions of appreciation, handcrafted by Cross. The cards also serve as a tribute to her son, OSSN Tyler J. Connely. Connely gave his life while serving his country. Since 2009, U-Haul has partnered with Cross to print and ship Tribute Journey greeting cards. “The atmosphere during the Holidays for Heroes Packing Event was very open and welcoming. This made it quite easy for us to fit in and converse with the other employees from different companies,” said Shawn Richardson, UHC of Brooklyn/Queens/Staten Island executive assistant. The Holidays for Heroes Packing Event was once again an amazing display of high-energy teamwork. It was also an opportunity for Cross and U-Haul to reach more active-duty troops through the Tribute Journey Project. The holidays can be a particularly difficult time for our deployed service members. But through the USO Care Package Program, and with the help of partners like U-Haul, the USO can bring the holidays directly to these service members. The USO strengthens America’s military service members by keeping them connected to family, home and country throughout their service. U-Haul, founded by a WWII Navy veteran and his wife in 1945, has been a proud sponsor of the USO for more than a decade. U-Haul dedicates a portion of its community work and charity support to veterans organizations and initiatives.